Home > Shop By Brand > BLACKFIRE Pro Detailers Choice Car Care Products > BLACKFIRE Tire & Trim Sealant 8 oz. BLACKFIRE Tire & Trim Sealant is far more than a trim dressing. This polymer-based trim restorer forms a bond at the molecular level, restoring the surface while coating it in a durable, protective shell. BLACKFIRE Tire & Trim Sealant doesn’t wash off in the rain – it actually causes water to bead up like a wax! Treated surfaces will have a factory-fresh appearance – not a sticky, greasy mess like other so-called trim restorers. BLACKFIRE Tire & Trim Sealant is a breeze to apply. Its thick, gel-like formula spreads evenly and dries completely. You can even BLACKFIRE Tire & Trim Sealant on hard and smooth surfaces. If used on hard, smooth surfaces, buff the surface dry with a clean microfiber towel. 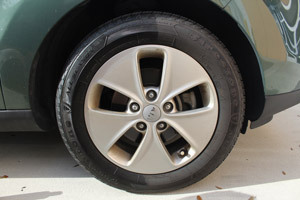 On tires, apply an even coat and allow to dry for 20 minutes before applying an additional coat. 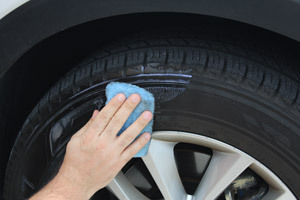 Apply multiple coats to tires if you want a glossy, shiny appearance. BLACKFIRE Trim & Tire Sealant Launch Special - Limited Time Only! I've had this for a month now , when following the directions it does not streak or bleed , it has lasted now for a month . It also is excellent at "restoring" faded trim . I found it will get at least 1 shade darker the day after applying . Well worth the $ .I attached a 50/ 50 photo of it on a friends 01 Cobra I did for him . The picture only partly shows what an excellent job it did restoring his trim . This is really good stuff. I've tried many of the popular plastic treatments and restorers available at my my local auto supply (Mothers, Meguiars, Stoner Trim Shine) but this stuff out does them all. Blackfire noticeably darkens black plastic trim to a satin finish but isn't greasy. Unlike other treatments, Blackfire forms a tight surface you can feel and water actually beads up and runs off of it--it doesn't streak or wash off in the rain. This little bottle treated all of the plastic on 2 mid-size cars, as well as the tires and large amount of textured black plastic on my full-size truck. I've already used up this little bottle and will be investing in a larger one. ProsDark Satin Finish that's not greasy, doesn't wash off in rain, lasts a long time. After using several different products from big box stores I was very disappointed. I had nearly given up on my trim until I discovered this product on Auto Geek. After seeing their photos and reading a couple of online reviews I decided to try it although I didn't have high hopes. I cleaned my front grille and then applied following instructions with a foam applicator. Immediately I could see a difference between the section I'd done and one I hadn't. With this small encouragement I did the rest of my trim and waited until the next day to see what it looked like under the sun. Normally, with the other products I'd tried, the trim would look great in the garage but when I pulled out into the sun you could see streaks and uneven application all over; this was not the case with Blackfire. I was extremely skeptical that I'd have any better results but was blown away not only by the evenness of the application and lack of streaks but also the deep, black look that came from the trim, even when looking in full sunlight! In my opinion, the trim looks much better than when it came from the dealer. As a bonus, water really does bead and roll off the trim like they say. One thing I can't yet speak for it longevity as it's only been on for one week. But, I can say that it has survived one rainstorm and I can't see any fading. Auto Geek is the only place I will shop for car-care products from now on. ProsAmazing look, even under direct sunlight! Water beads right off. Used on my Kia Soremto plastic trim that sits outside. Looks good so far. Easy to apply and does restore fading trim. 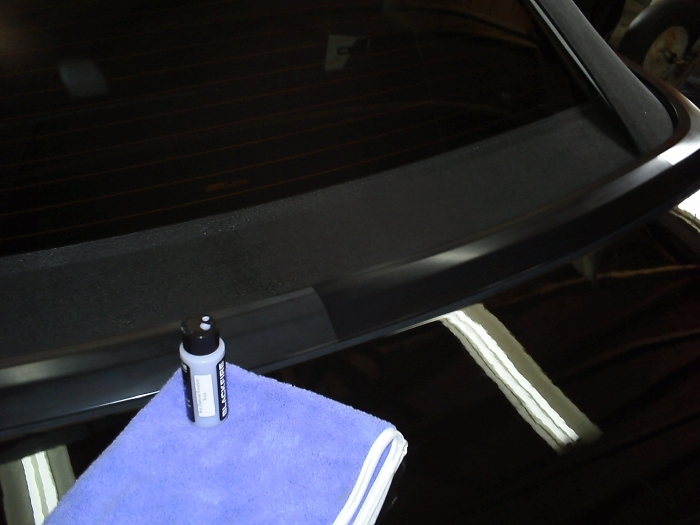 It restores better then Wolfgang exterior trim Sealant from my experience. Time will tell if it lasts as long. Pros-Easy to apply - fun to watch water bead on the plastic.